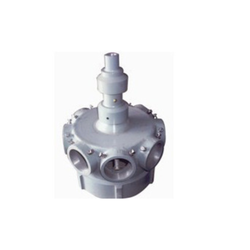 Automatic rotary sprinkler system made of cast aluminium alloy or cast steel (optional) material With rotary head. Offered at industry leading prices, these pipes are manufactured as per the standards laid down by regulatory bodies. Cooling Tower Sprinkler Pipes - PVC Pipes.Cooling Tower Sprinkler distibution pipes. This rotating sprinkler distributes the incoming water evenly over the entire fill area. It rotates at a speed of 12 to 16 RPM. It is a PVC pipe sprinkler system having graded holes for uniform distribution of water. Its features are die-cast aluminium alloy body and up to 15 ft. sweep diameter with 4, 6, 8 pipes. its reputation on the quality, reliability and innovative features found in its rotary sprinkler line and continues to set the benchmark by which other manufacturer’s rotors are judged. 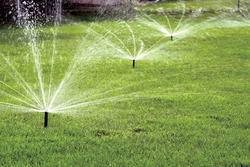 For spacings from 15 feet to 160 feet, you’ll find a irrigation sprinkler that meets your needs. Rotating Sprinkler: 1" & 3/4"
Gear Driven Pop-up Sprinkler: Hunter made its reputation on the quality, reliability and innovative features found in its rotary sprinkler line and continues to set the benchmark by which other manufacturer’s rotors are judged. For spacings from 15 feet to 90 feet, you’ll find a Hunter rotor that meets your needs. We hold expertise in manufacturing a huge gamut of Rotating Sprinkler for cooling towers which are highly demanded and appreciated by our customers. We assure the customers optimum quality and long lasting products at affordable rates in market. These are known for perfect finishing, long service life and sturdy constructions. - Automatic Rotary system made of Nylon 66 & Aluminum. - Applicable for Round cooling towers. Sprinkler providing water to vegetation, sprinkler that spray water in fixed Pattern.